NYC, 05/01/2019, 5:00PM. 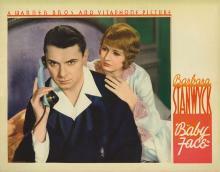 Baby Face (1933): Woman Wants To Go To The Top . 71 min. Director: Alfred E. Green. In 2005 it was deemed "culturally, historically, or aesthetically significant" and selected for preservation in the United States Library of Congress National Film Registry.